Junction of Seneca Creek and the C&O Canal, just NW of the aqueduct. May 30, 1724 - Middle Plantation was surveyed for Daniel Dulany. It embraced seven hundred and twenty-two acres. This tract is situated at the mouth of Great Seneca, where the Chesapeake and Ohio Canal passes through it. November 1780, Daniel Dulany, because he was a Loyalist during the Revolutionary War, had his lands in Montgomery County at Seneca confiscated. They were offered for sale by the Honorable Alexander Contee Danson, acting for the State of Maryland. Oct. 25, 1781 Robert Peter acquired lots two thru seven of Daniel Dulany's land at an auction. In 1806 Robert Peter died and by the terms of his will, left his Seneca land to his sons: Thomas, who was married to Martha Custis, the granddaughter of Martha Washington; George, who married the wealthy Ann Plater; and David, who was a bachelor. 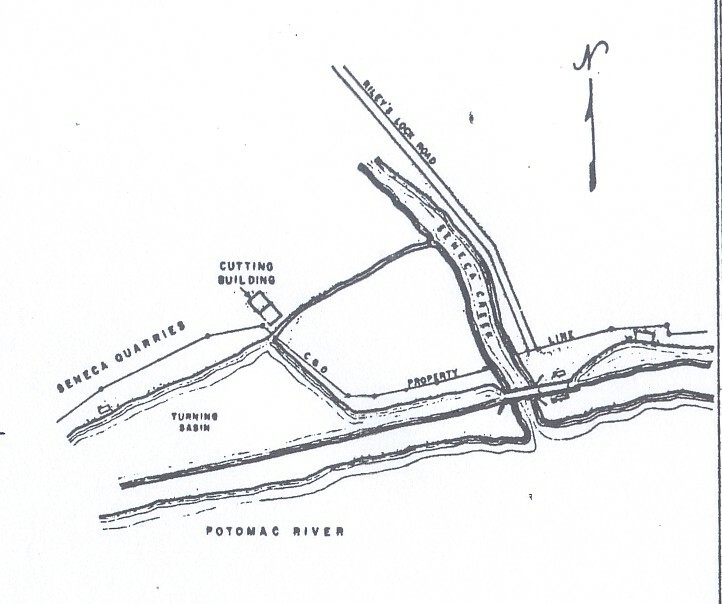 The Peter heirs developed the red sandstone and marble quarries along the bank of the Potomac River. Thomas, inherited the land where the mill was to stand. 1820's - John Parke Custis Peter inherited the property from his father, Thomas. He constructed the mill around 1837. 1832 - The Seneca Aqueduct was completed and water was in the canal by 1833. The canal supplied the water used to drive the mill. The mill was doubled in size sometime later. Jan. 19, 1848 - John P.C. Peter died leaving the mill in trust until his oldest son, Thomas Peter, turned 21 in 1855. 1876 - The company went bankrupt. The quarry ceased operations and was put in court receivership for seven years. April 22, 1882 - The company’s property was auctioned off. The winning bidder was John Cassels, who was said to represent a group of New England investors. 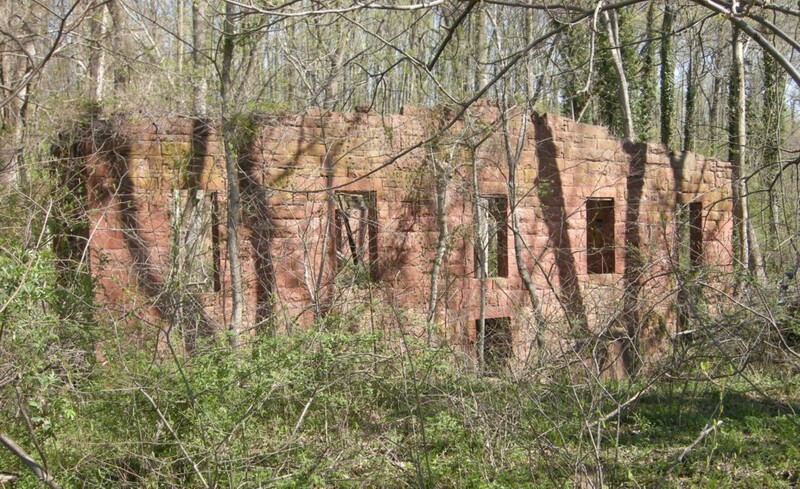 They formed a new company, the Potomac Red Sandstone Company. 1889 - A flood ripped a 150 foot section out of the towpath opposite the Seneca quarry and required nearly two years to repair. This put the Potomac Red Sandstone Company out of business. Dec. 20, 1890 - An auction was scheduled for the mill and other property. It was purchased by George Mann. 1891 - The mill was reopened by George Mann under the name, the Seneca Sandstone Company. The quality of the stone from the quarry declined significantly in the pursuing years and the demand for the stone decreased as fashion turned to other building materials. 1901 - The mill closed for good. 1903 - The "Quarry Farm", a large piece of property which included the stonecutting mill, was sold to Charles Allnutt and Thomas Darby. 1946 - Harry and Eugenia Pierpoint bought Quarry Farm from the Darbys. 1972 - The state acquired the land from Eugenia Pierpoint and it became a part of Seneca Creek State Park. The design of this mill is unique due to the fact that it is located at the top of the water fall used to power the mill instead of the bottom. Most mills have a mill run that goes upstream to collect water at a higher level than the mill. The mill run keeps that water at a higher level as it flows to the mill. There the water from the mill run fall onto the water wheel to power it. 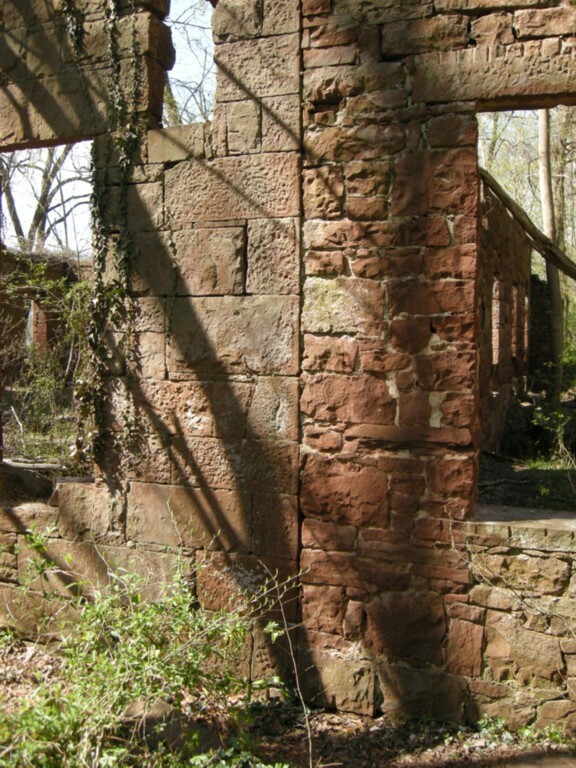 The stonecutting mill was built at about the same level as the water in the C&O canal because there was no other suitable site where it could be built at a lower level. As a results, the wooden water wheel itself had to be lowered to create a fall of water. This placed the axle of the water wheel and its associated drive shaft below ground level. To accommodate the drive shaft at this below ground level, a trough was dug across the inside of the mill. Water from the C&O canal was purchased from the Canal Company in order to power the mill's breast wheel. A breast wheel is one in which the water strikes the wheel about half way up the wheel. After powering the mill's water wheel, the water flow out the tail run to Seneca Creek which is located about 14 ft. below the surface of the canal water. The mill's water wheel was replaced by a turbine at some unknown date. It may be noted that the very popular Laffel turbine was being sold in 1863. The trough running thru the mill is stoned line and measures 11 ft. wide by 6 ft. deep. The drive shaft from the water wheel ran thru this trough. The shaft was used to power the drive belts of the stone cutting and polishing machines. On the floor inside the mill are narrow-gauge iron track. Each rail of the track is 3 in. wide and 2 1/2 high. The tracks were used by a rail cars to move the massive stone blocks into the mill. The mill operated in the following fashion according to Raymond M. Riley in an Aug. 4, 1979 interview quoted in the book "Home on the Canal" by Elizateth Kytle. 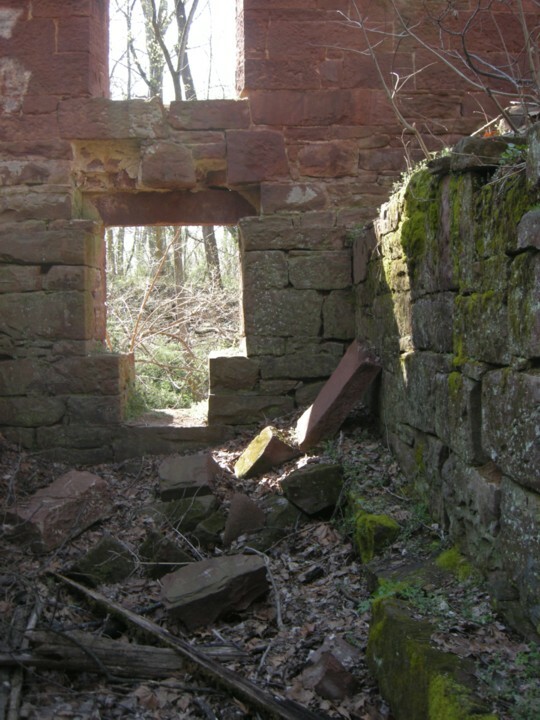 A large rough piece of sandstone was place on a little car and brought into the mill. It was placed under the saw blade which was then lowered onto the stone. The blade went back and forth just like people sawing wood. When a piece of stone was sawed off, they took the remaining stone back outside the mill, turn it over, put it back on the car, and bring it back into the mill to saw that side off. If they wanted all sides sawed, they'd repeat the process until they sawed it square. To polish the stone, they would place it on a big round wheel which turned underneath the stone. Water and sand were poured on the wheel to grind the sandstone smooth. It was called a planing wheel. A few stonecutters, acting out a harking back to the longstanding tradition, made their marks on randomly chosen stones. In the picture of the mill below, taken from across the turning basin, one can see the stockpile of stone to be cut to the left of the building as well as the tall derrick used to move the stone. The initial building, closest to the hill, was made of a more primitive sandstone while the second building, an addition to the first, is made of a more finely crafted sandstone blocks. The 1882 auction described the property as a large Stone Mill, with the necessary machinery for twenty gangs of saws: a Second Mill with the machinery for four gangs of saws. The saws cut thru the sandstone at the rate of about one inch an hour. Water was dripped onto the saws to lubricate the blades. Perhaps the trough also collected the water and channeled it outside the mill. 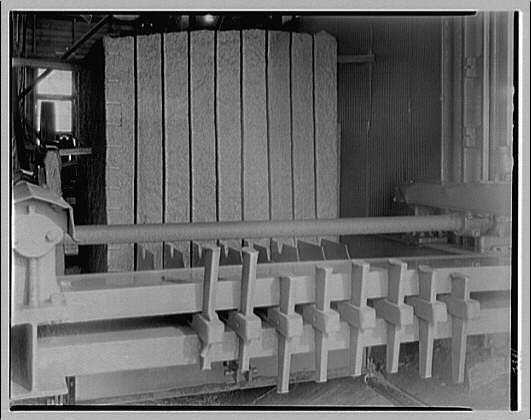 The saws used in the mill are unknown, however, an example of stone cutting saw used on the George Washington Stone Corporation's mill is below. Note: The trough in the building has lead to misconceptions about its use. One conception is that the wooden breast wheel was inside the building. Supposedly, water from the C&O canal was pumped up to wooden troughs which conveyed the water thru the building to the water wheel. There are numerous erroneous assumptions about this model. There is no evidence that such a pumping station existed. In fact, it makes no sense to pump water up from the canal given the 14 foot fall already existing between the level of the water in the canal and the level of the water in the nearby Seneca Creek. The diagram assumes the water wheel was located inside the mill which is unprecedented since all wooden water wheels were located outside the mills. The large deep hole outsite the wall of the mill is the obvious location of the wooden water wheel. This hole is where the tail run originates. The concept that water was run thru the trough to drive the water wheel makes no practical sense. The trough dead ends at one side of the mill so no water can enter it there. The other end has the access hole for the drive shaft. It's width is considerably smaller that the width of the trough. The elevation of the water in the C&O canal dictated the dimensions of the water wheel and its elevation. The use of a breast wheel in place of an overshoot wheel may have been made to reduce the amount or excavation needed to accommodate the water wheel and its tail run depth. The elevation of the water wheel's axle dictated the need for the trough used by the drive shaft. 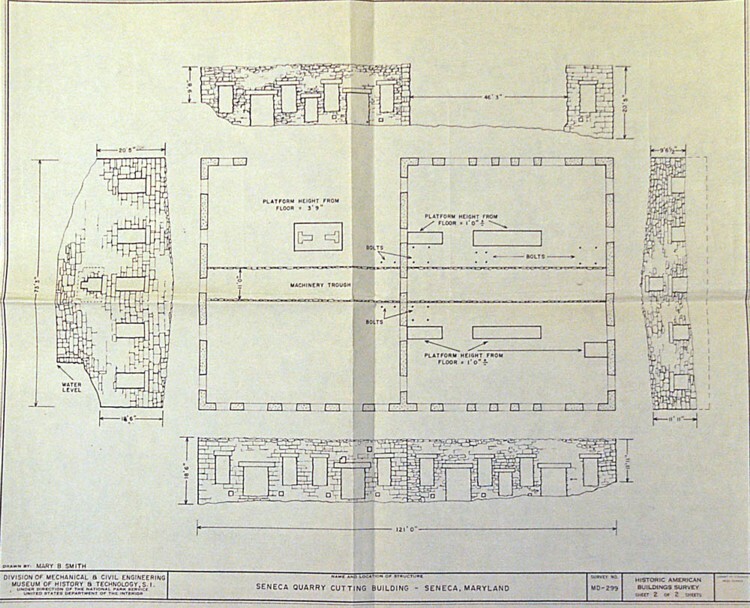 It is safe to say that the breast wheel was located outside the building and the trough was used to house the drive shaft from the water wheel as given in the document in the Maryland State Archives.